We only use the best Alaska fishing tackle and quality gear on our fishing charters. We are proud to have a fine line of sponsors who supply top quality fishing rods, reels, lines, and tackle. 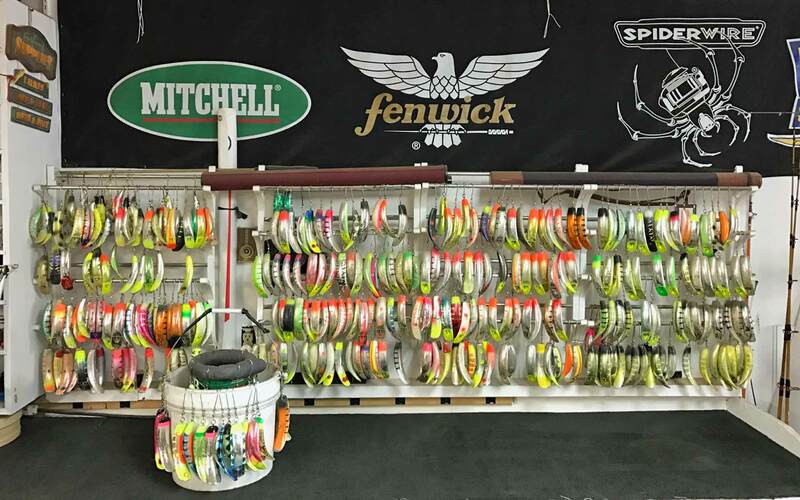 We’ve put together a list of the gear we choose for Kenai River king salmon fishing, trout fishing, and Alaska saltwater charters. I have been using this series for 20 + years. It has been a big help getting 70 and 80 pound kings to the boat. I like to run all 4 rods in the 10.6 series in my boat. Damond likes to run the same rod in the 9′ length. This is another rod we run for light kings. It also comes in a 10.6 and is great for pulling plugs. This reel has come a long ways. I used to think it was the best reel for kings or medium sized salt water fish. Now I know it is the BEST reel out there. It has a one part body, a 30 pounds of drag, a left handed option, and new for 2019, water proof line counter. I had the pleasure of trying the new Fathom 2 in 2018 and I can’t wait to have them in all our boats for the 2019 season. This rod is a lot of fun in the salt. Line – Nanofil 14lb low-Vis green. Cannon Balls – 1/4oz to 3oz , 40lb big game leader, cured eggs.